Replacing your missing teeth has never been as predictable or effective as it is with modern dental implants. Whether you have one missing tooth or are thinking about trading in your removable denture for something more permanent, we have a variety of implant options to choose from. 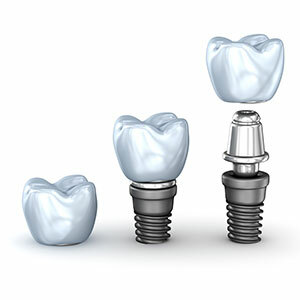 Implants are made from biocompatible materials that are shaped to mimic the size and shape of a tooth root. When placed into your jaw, new bone fuses with the implant to secure it in place. For most patients, investing in an implant means having a missing tooth solution that lasts for the rest of their life. A Single Crown — An independent implant with its own individual crown is the most lifelike type of “replacement tooth” compared to any other type of treatment available. Simply brush and floss it like you would the real thing. A Multi-Tooth Dental Bridge — Do you have a few teeth in a row that are missing? We can use a pair of dental implants to support each end of a fixed bridge, replacing multiple teeth at once. A Fixed or Stabilised Denture — With as few as four strategically placed implants, we can secure a full arch denture that is permanently set into place or removable for easy care and maintenance. The total number of implants you need will vary, based on your immediate and long-term needs. During your consultation we will discuss the options available, so that you can select the most appropriate one for your budget and lifestyle. Contact us today to schedule a consultation. We’re open on Saturdays with flexible payment options available.